As I correctly predicted two days ago here... This from the BBC. 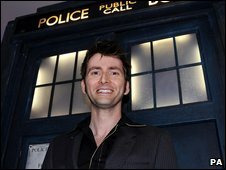 The name of the actor who will replace David Tennant as Doctor Who will be announced on Saturday. Tennant said in October that he would stand down from the show after filming four special episodes in 2009. His replacement - the eleventh Doctor of the TV series - will be revealed in a Doctor Who Confidential programme on BBC One at 17.35 on 3rd of January. The casting decision has been a priority for the show's new creative team, led by executive producers Steven Moffat and Piers Wenger. The BBC said that in Saturdays Doctor Who special the actor playing the new Doctor will be giving his or her initial reaction to becoming TV's most famous time traveller. Wenger, head of drama at BBC Wales, said We believe the actor is going to bring something very special to the role and will make it absolutely their own. I just can't wait to tell everyone who it is - it has been a nail-biting Christmas trying to keep this under wraps! Shortly after Tennant's announcement, bookmakers were tipping several well-known names as the next actor (or actress) to step into the Tardis. Murphy's Law and Cold Feet star James Nesbitt emerged as one of the favourites, along with Paterson Joseph, John Simm and David Morrissey - who appeared in the 2008 Christmas special. Paterson Joseph, who recently starred in Survivors and appeared in two Doctor Who episodes in 2005, has said any actor would love the challenge of playing the Time Lord. Bookmakers made him an early favourite - offering odds of 3-1 on him becoming the first black Doctor. Comedian Jennifer Saunders, former Doctor Who assistant Billie Piper and film star Catherine Zeta Jones have also been mentioned in connection with the role. The show's outgoing executive producer Russell T Davies said last month Whoever becomes the Doctor has got to take on a whole life. It's not just becoming a part of a TV show. In October, when Tennant was asked who he thought should replace him, he joked Well, I've always been a big supporter of Wee Jimmy Krankie! After a TV movie in 1996 - starring Paul McGann - the TV series returned in 2005 with Christopher Eccleston in the lead role. Tennant took over the role the same year. I will have the name of the new Doctor on this blog as soon as its announced, plus the program online sometime on Sunday too! John Simm? The Master? no way! i can't wait to hear the identity! Oh my God! How exciting! I can not wait!!!!!! I hope it's someone decent though.